It’s that time of year again, when the smell of searing burgers begins to waft through your weekend and Home Depot starts advertising their line of gleaming Webers. With our seemingly endless winters, the beginning of the grilling season is as much a beloved sign of spring to many New Englanders as Red Sox opening day. For those carnivorous grill masters among us who obsess over creating the perfect burger or the serving the tastiest ribs, the first stop this spring should be The New England Meat Market on Walnut St. in Peabody. This third generation family-owned business, which also has a location on Broadway in Cambridge, is the place to go for fresh beautiful steaks, chops, ribs, and roasts as well as a huge range of house-made marinated steak tips, chicken and lamb kabobs. We recently brought home some of the marinated steak tips ($6.99/lb. ), which were phenomenal. The meat counter is reminiscent of an old-fashioned butcher shop, where the cuts are chosen with care, trimmed to order and wrapped in white butcher paper while you wait. Special orders are encouraged and may be called in ahead of pick up. There are also refrigerator and freezer cases with specialty cuts and imported items. 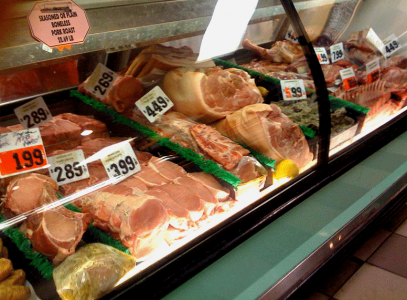 New England Meat Market specializes in American lamb, and their lamb prices are generally a few dollars less than supermarket prices. In fact, despite the great quality and service, most of their prices remain competitive with supermarket prices and their weekly specials are worth keeping an eye on. This week’s featured lean hamburg at $1.99/ lb. and boneless pork roast at $2.89/ lb.The specials flyer is conveniently available on their website, as are their super saver deals; if you’re planning to feed a crowd or just want to stock your freezer, these packaged deals can save you up to 20%. The market also carries a fascinating array of foods; they have a wide range of Greek and Mediterranean specialty items, a decent produce section, breads and baked goods from several local bakeries, beer, wine, and standard convenience items as well. In addition there is an extensive deli, which offers sandwiches, sliced meats, and quite a few salads. The prepared foods section is another wonderland: entrees, soups, meatballs, desserts. A new discovery there became an instant favorite—house-made Greek Lemon Chicken Soup; the creamy broth was unexpected, both tangy and savory, with rice and chunks of chicken. 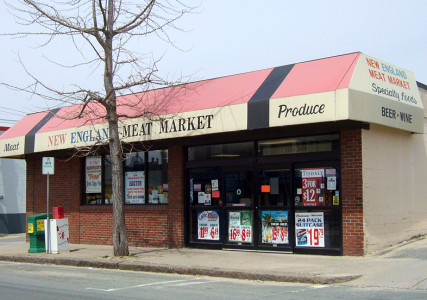 They open at 8 a.m. seven days a week, so if you are planning a backyard cookout or just looking for an excuse to fire up the grill this weekend, a visit to New England Meat Market should definitely be on your to-do list.